I am trying to create a Dropbox form but it keeps asking me to allow Dropbox. I get this message from Dropbox "JotForm would like access to the files and folders in your Dropbox" I click allow and it brings me back to the same JotForm page asking me to log into dropbox. When I look at my dropbox account it says that the JotForm App has Full dropbox Access. I see that the DropBox is already connected to your JotForm titled "Photo Class Image Submission Form". Please try uploading a file and submitting the form to see if the uploaded file stored in your DropBox as per the folder selected. 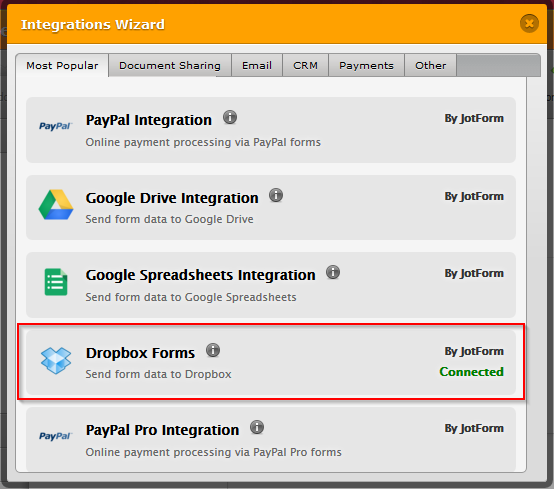 If you see any issue with the integration, you may remove it and then reintegrate with DropBox. Please let us know if the issue still persists. We will be happy to assist you.